I was born and raised in Devils Lake. I went to Devils Lake High School, graduating in 1973. From there I worked for my father, Michael Kurtz Construction in constructing commercial buildings. In 1985 I got involved in the lumber business, becoming manager about 1986. Having the background in construction, I fit in well. Later, my brother Doug Kurtz and I mad an agreement with my father, Mike, to take over the business. Doug and I are the owners of Lake Lumber. I have been involved in a number of clubs. I have been a member of the Devils Lake Elks for 40 years, being Trustee for 2 terms and Exalted Ruler twice. I am also a member of the Knights of Columbus Club, both the 3rd and 4th degree. I served on the Devils Lake Chamber of Commerce board also. Currently I am on the Board of Directors for the Horizon Financial Bank, which have branches in Devils Lake, Onsabrock, Munich, and a new bank going up in Bismark. This is also my 2nd time holding the President position for the NDRLA and I'm very proud of it. 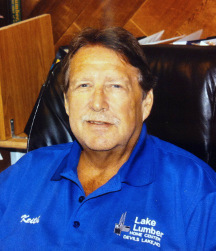 I have been involved with the NDLRA since I became active in the lumber business years ago, serving as director in 1987 and several times off and on, up to the current date.